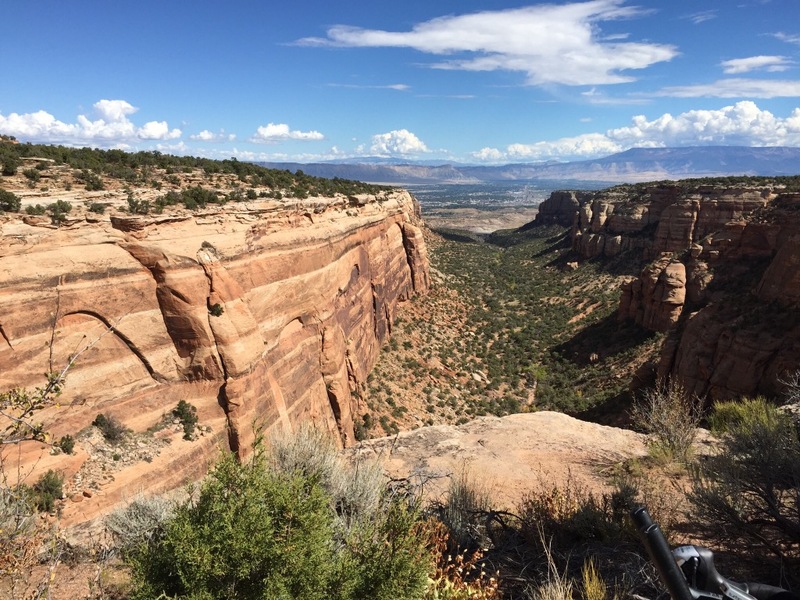 A few months ago, some of our friends decided to sign up for the Tour of the Moon, a 5-year-old bike tour in Grand Junction, Colorado that is gaining in popularity as a late-season destination ride. 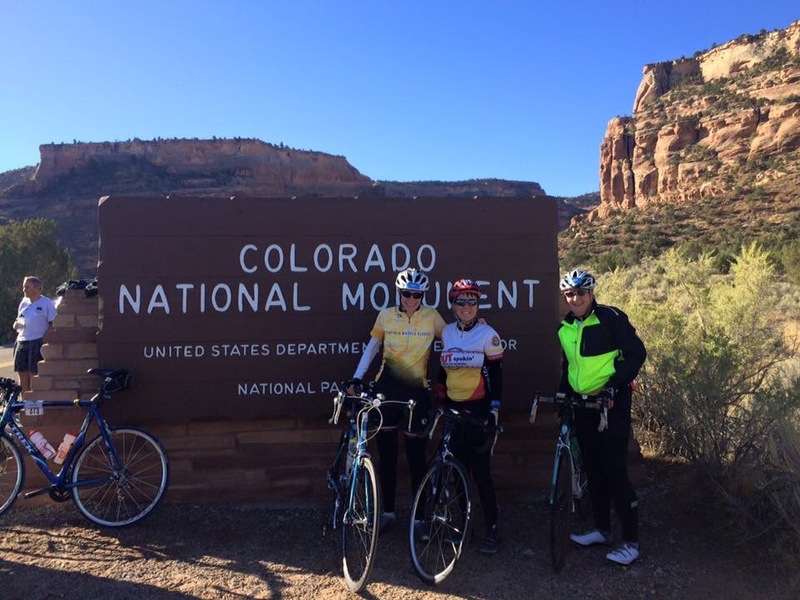 It sounded like a nice trip, and a good goal to keep our cycling momentum going, so we signed up too. Maureen is writing about our journey to Grand Junction, so I’ll skip over that and just say we arrived in Grand Junction at 4 p.m. on Friday, just in time to pick up our packets at the Two Rivers Convention Center. It had been a long, dusty day with a hike in it, so we had some cleaning up and resting up to do once we checked into our hotel (the familiar, affordable, and non-smoking EconoLodge). We had arranged to meet our Denver cycling pals for dinner. Our first reservation had earlier been “revoked,” (I’ll refrain from mentioning the restaurant name, though I am tempted) due to bad management or planning or customer service, so we had ended up with a date at The Ale House, part of the Breckenridge Brewery chain. It was great to see friends, but the food was “meh” and it was loud and not easy to converse with those more than two seats away. We all scattered to our respective lodgings to rest up for the next day, with a plan to meet at City Market at 8:00 to depart together. The morning was cool, but clear, a great day for a ride. 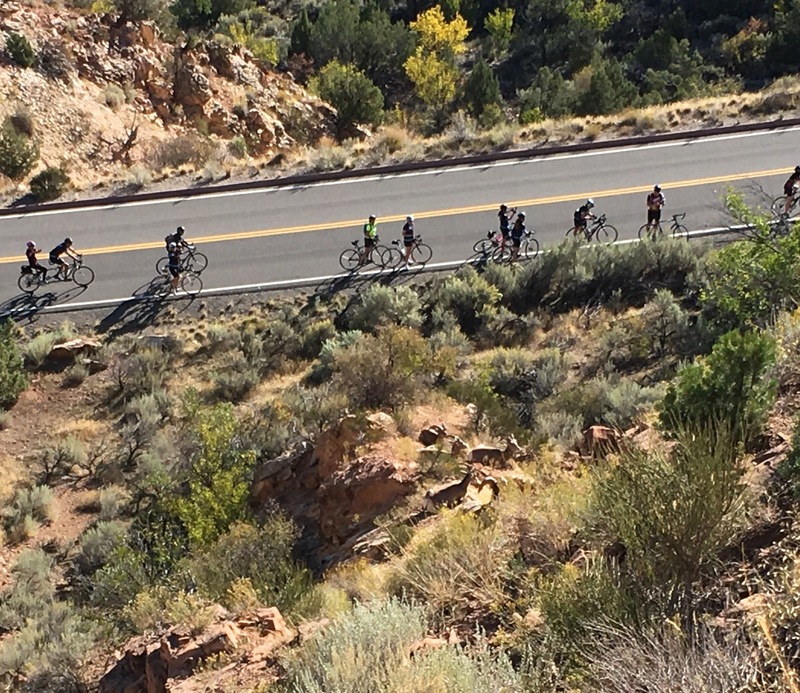 Only a few of us were doing the shorter, 41-mile route. No matter which route one chose, the climbing started almost immediately. 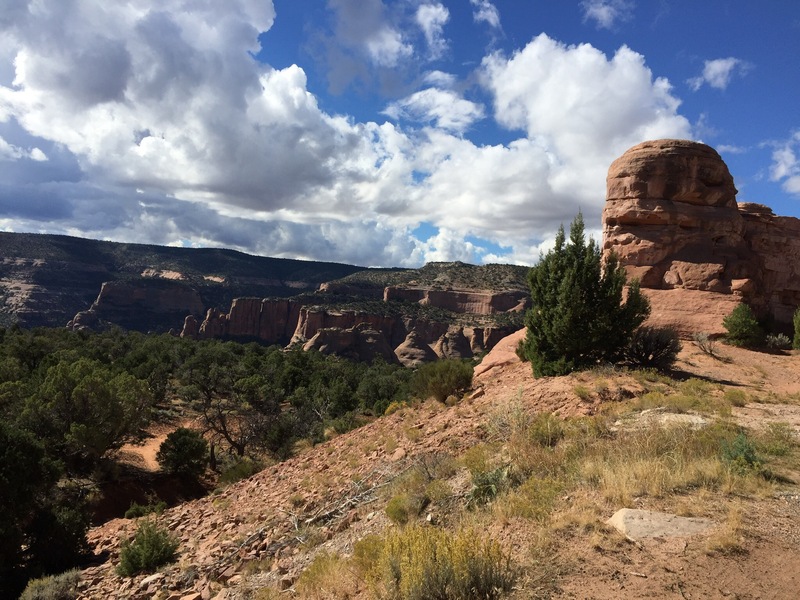 We had a short photo-op (and light check and clothing removal) stop when we entered the Colorado National Monument. Another photo-op came shortly thereafter on a particularly steep climb up to a tunnel. 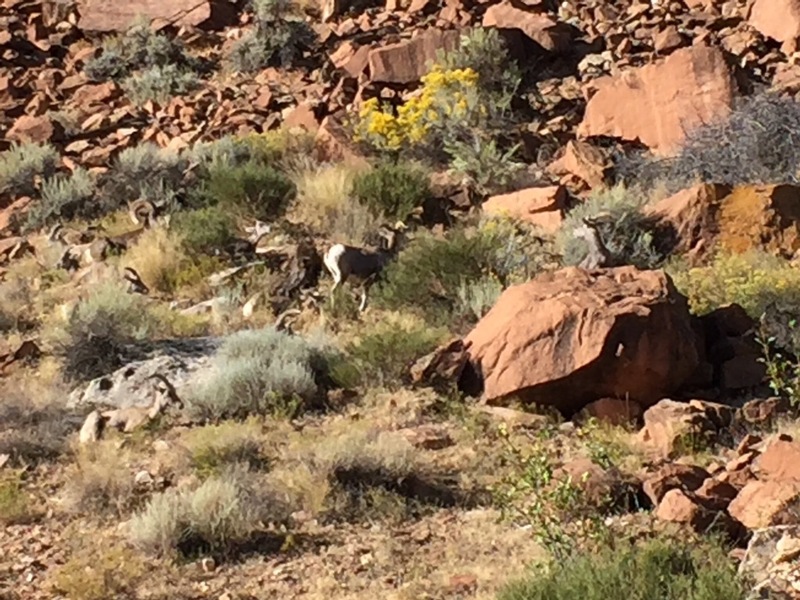 I stopped to wait for Maureen, but didn’t know why so many others had stopped until I saw the Bighorn Sheep below me. From here we climbed on to the first (and only, for 41-mile route riders) aid station. Grub was pretty good–bananas, bagels, muffins, Clif bars, Clif shots, watermelon, and oranges. I can’t say I’m a fan of the Nuun drink, but I tried it. Finally, the climbing was over. At the water stop near the top, I donned my cycling jacket, as the brief bits of descending so far had been quite chilly. The descent was a little scary, but fun. Sadly, though, when Bettina and I entered the final tunnel, we encountered a crash that had happened moments before. It was really dark and descent speeds were high, so there was no time for eyes to adjust. We joined the shouting to get those behind us to stop and dismount. The rangers and medics arrived almost before we were out of the tunnel. Most of the rest of our group, it turns out, was caught in the traffic jam that formed behind the tunnel closure (necessary for ambulance access). We never found out what happened to the gentleman who crashed, but I hope they will consider portable work/flood lights for that tunnel next year. The finish area was packed by the time Bettina and I arrived, we were fortunate to find spaces in the bike corral, when some folks removed their bikes to leave just as we walked up. We settled in to wait for our spouses, since neither of us had car keys in our possession. We found another teammate and did some people-watching. Lunch, once all our peeps had finished, was in the adjacent Convention Center. The spread was pretty decent. There was spaghetti, optional meatballs, cooked mixed vegetables, salad, bread, and cookies. Sadly, the only free beverage was coffee, which was a bit surprising considering the fairly-high registration fee and the fact that there was beer available–but for a fee. It was nice to sit and relax with the whole crew for a while after a long morning in the saddle. At lunch we also confirmed the evening’s plans. A teammate’s sister and brother-in-law, who live in Grand Junction, had graciously offered their home for our evening gathering. We set a time and all headed back to our lodgings to clean up and rest up. The evening’s get-together was one of the highlights of the weekend. 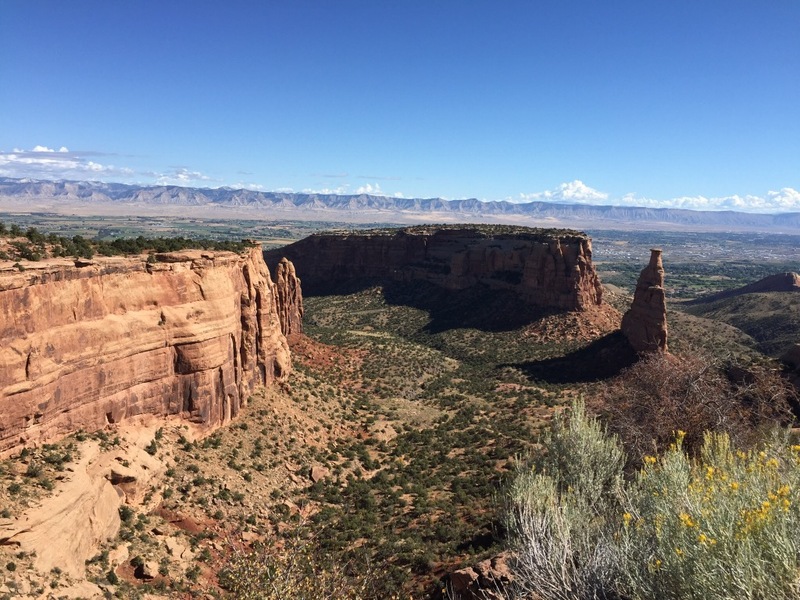 Our hosts live high on the hills of Grand Junction, so the views are fantastic. The early-October weather was perfect for dining on the outdoor porch. Thai food had been ordered and picked up, which worked well for a group with varied dietary restrictions and tolerances for spiciness. It was yummy. And for dessert, what else but ice cream? The hospitality, the company, the weather, and the food were all great. Sigh. We needed to be in Denver by 2 pm Sunday (so I could get a massage! ), so we knew it would be a somewhat early start. Some of our friends were interested in breakfast out though, so we did a little research and arranged to meet at Dream Cafe at 8. It was a good choice. We had strong coffee and good conversation. Breakfast was tasty too–I had a California Benedict (Hollandaise on the side of course, a discussion for some other blog) while others in the group had omelets and Cinnamon Roll French Toast. Well worth a visit, as additionally evidenced by the huge number of people waiting outside when we left. 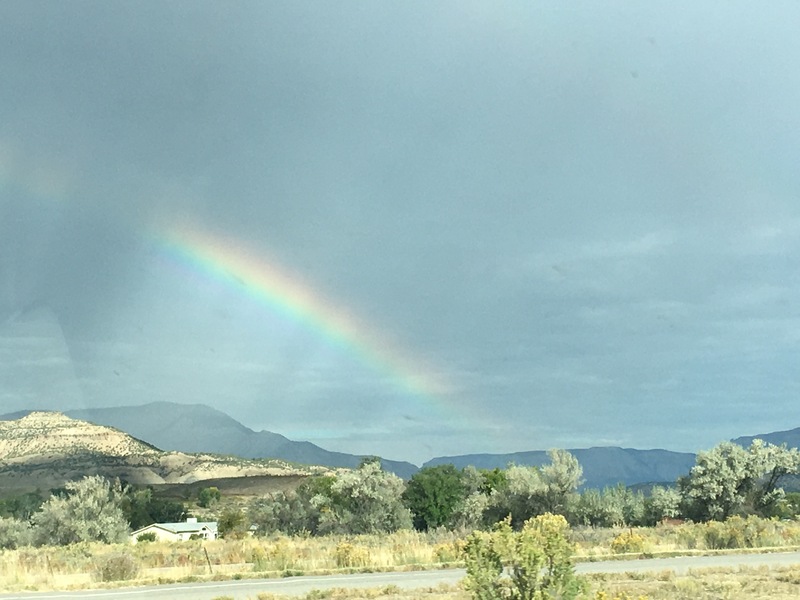 The drive to Denver was long, but at least we got a fantastic rainbow!